A compact, rounded crepemyrtle. The flowers are pure white. It starts blooming early and continues to bloom throughout the summer. It grows best in full sun. It is drought tolerant once established, however, regular summer moisture will improve flowering. 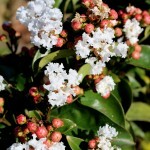 If needed, prune when dormant as the flowers occur on new wood. This is a Dr. Michael Dirr introduction. PP 23,168.